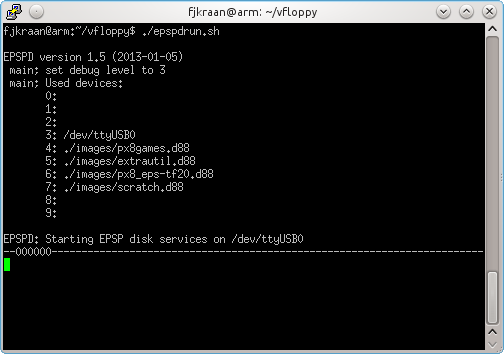 Vfloppy is a disk simulator for the Epson PX-4 and PX-8. It uses the epsp protocol used by the Epson TF-15, TF-20, PF-10 and compatible disk stations. It is written in C for Linux, and should be portable to any *nix with standard libraries. Apart from the program, only a serial port and a cable to connect it to the PX-4 or PX-8 is needed. The original version, written by Justin Mitchell and friends, consisted only of a TF-15 simulator for the PX-4 and a formatter to create empty images. The floppy images were files containing only the sector information of the tracks 4 and up, as the lower tracks are not used by CP/M. This format uses the extension ".vfd". The versions 1.1 to 1.4 add support for the PX-8, and a read and write utility to transfer files between the images and the file system. Due to a bug, only file sizes below 32 kByte are supported by these utilities. These versions of the utilities use functions which make them less ideal for porting to Windows. With the advent of the PX4 and PX-8 emulators, a new floppy image format appeared, Pasopia D88. As this format contains the complete floppy (also tracks 0 to 3), the simulator could in principle also support the HX-20 command set. The 2.0 version of the simulator is an almost complete rewrite based on the Epson protocol description. This was done to make extension of the command set doable. By the way, only the basic commands for reading and writing are supported, the commands for formatting and disk copy are not. Having those too would be nice, but not really needed as these operations can be done on the host computer. The emulator site has programs to convert Teledisk and ImageDisk images to D88. Because of this, and that there appeared to be no read and write utilities for the Epson PX-4/8 D88 format, I converted the simulator and utilities to this format. By the way, neither the simulator and utilities have any knowledge of the image structure, they only know where to read or write the data. The latest version finds actual sector locations instead of assuming interleave = 1. Another advantage of the rewrite is that the source can be made more portable. The 2.0 version of the utilities can be compiled from the same source for both Linux and Windows, and both executables are included. The simulator isn't available on Windows, due to lack of time and clean, portable code to support the serial port on both platforms. Improved support for the D88 format. Refactored code. Added compiler flags for ARM (Raspberry Pi, BeagleBone). Note: These utilities are not generic D88 read and write utilities, but only for the Epson HX-20/PX-4/PX-8 floppy format. They will happily corrupt your images for other formats, no checks are included. Version 1.3 adding a image write utility. Due to a disk crash, some functionality may be lost, including bug fixes. Not a new bug, but recently discovered: saving files larger than 16 kByte does not work properly. See doc/bugs.txt for more info. Extra images for the PX-4/PX-8 (doc included). Interim version 2.0 of epspd This package contains the rewritten simulator for the VFD format, no utilities..
D88 floppy image utilities Quick and dirty d88 image support, source only, not Windows compatible. Use this only as an example of how not to write C.
D88 Variant with Windows EXE-files. With O_BINARY flag added, compiled with CygWin/MinGW/MSYS but untested. Quality same as above. Vfman 2.0 for D88 Source and binaries for Windows and Linux. The program structure is much better, and the proper I/O functions (fseek, fread, fwrite) allow compilation to multiple platforms. Binaries for x86-32 Linux and Windows are included. Vfman 2.1 for D88 Source and binaries for Windows and Linux. Erase and vfd conversion utilities added, vformat improved, some documentation. Alas not the major structural improvement I planned, but that will only bother those who look at the code :-). Epspd88 version 2.1 Rewriting this to a more portable format will take more time and knowledge than currently available, so only the D88 format is implemented. Virtual library, in the HX-20 Technical Software Manual chapter 10-11 and the PX-4 Operating System Reference Manual. Some info on the D88 Pasopia 7 format as used in the QX-10, PX-4 and PX8 emulators. Info on the Epson CP/M directory. Now I finally think to know how the directory extend format is suppost to work, I wrote it down. It differs enough from the documented CP/M directory formats to be confusing.